In the Fall of 2012 we added a new feature to our website… wonderful old photos from the area that are sadly of unidentified people! We’ve been adding photos to our website in the hope that someone will be able to identify a few faces. 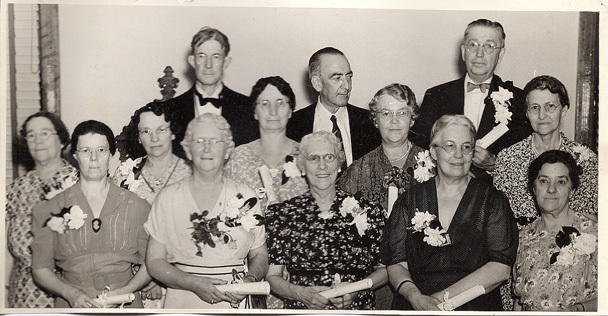 This one, undated, may have been of the Eastern Stars, the wives and family members of the Masons. We invite your comments– or any clues to the identities of anyone in the photo! To see more photos and help us identify people, places and dates, please visit our website at www.thewaldenhouse.org and then choose the “Do You Know Me?” page. Thanks to a couple of our Facebook page friends–Nancy Scalzo Phelps: “These women were probably 55” and from Sandy Delmonico: “Lower right hand corner, Alice Baisley?” Please see the comments section and indicate anyone you might know. Thanks for writing,Marianne! A quick check with our knowledgeable Trustees…(specifically, Marcus Millspaugh) Looks like it was “Washington Camp 4” and they met here in Walden, NY at the Walker Building. Thanks, Mickey.